The classic 1945 film noir Scarlet Street remains one of legendary director Fritz Lang’s (Metropolis) finest American films. 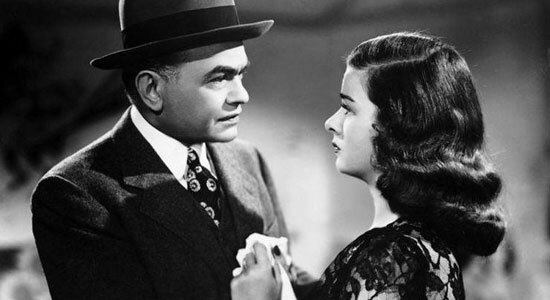 Joan Bennett gets under Edward G. Robinson's skin in Scarlet Street. When middle-aged milquetoast Chris Cross (Edward G. Robinson, The Stranger) comes to the aid of damsel-in-distress-ish, street-walking bad girl Kitty (Joan Bennett, Man Hunt) one rainy New York night, he plunges into a whirlpool of lust, larceny and revenge–the kind that one finds in any great film noir. Chris’s obsession with the irresistibly vulgar Kitty grows as her nasty pimp boyfriend (Dan Duryea, The Woman in the Window) gets involved, ultimately corrupting and humiliating Chris and turning him into the kind of man he never wanted to be. Will justice triumph? Well, yes…and no. Available on disc in various qualities from a handful of suppliers over the years, Kino’s 2005 DVD is the best of the bunch. And the gorgeousness of this Blu-ray edition is guaranteed as the film is transferred from a 35mm Library of Congress vault negative. Bonus features include a photo gallery and an audio commentary by film historian David Kalat, who we last heard waxing cinematic on the chat track from Criterion’s recent Godzilla release.